I contacted the Lily Cup and wanted to try out their product because I was intrigued by its unique design. I was getting to the point where a cup was a cup was a cup. There were only slight variations between designs and brands. It was refreshing to see this innovative, sleek, clean design! Needless to say, I was pleased with my interaction I had with the company and it's representatives. Along with one of each size of the Lily Cup, I received a few bonus products which I will speak on later. I would suggest going to their website and browsing their impressive line of feminine products: http://www.intimina.com/en/ the list is impressive! As you can see from the photo above, I received a pretty pink package in the mail from Intimina. The products are well made and with very posh material! The pouch that holds the cup is a silky soft fabric that feels so nice in your hand. I really like the pouch. The cup itself... I went with the Size B because I have had 2 vaginal births and have a heavier-than-most flow. It is a quite long cup but that isn't really a problem for me. I can get almost any cup to fit for me. You can see the exact dimensions HERE. With the lip of the cup, I wanted to make sure I read the directions thoroughly to be sure to give the cup a proper go. I tried both the "Punch Down" and the "Roll Up" methods and realized fairly quickly that the "Punch Down" was by far the easier, more efficient way to go. 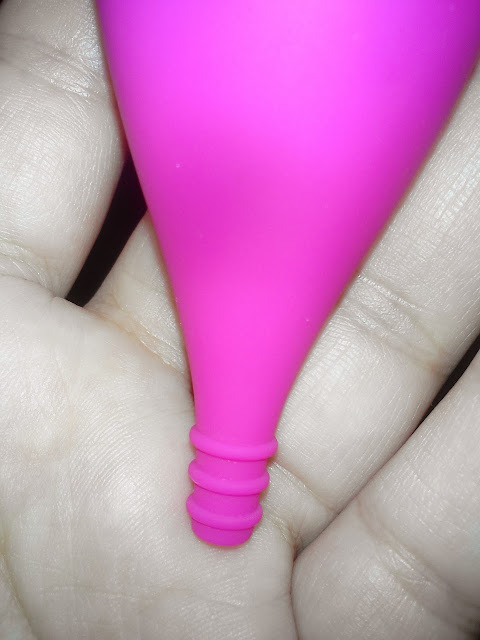 There are no air holes on the Lily Cup so your method of insertion may be different than it would be for another cup. I would recommend this cup to anyone looking for a cup who has a high cervix. This would even be a great first-timer's cup because of the ease of insertion. The high capacity of this cup, along with the innovative rim, leaking is close to impossible. If I were to rate this cup, I would give it 6.5 out of 10 stars. I really like this cup and am excited to have it! Along with my cups, as if that wasn't enough, Intimina sent me some of their other products to sample! I have not had the opportunity to try them out yet but I will return and add to this blog when I have. I received 2 Thermal Relief Patches which helps to relieve cramps, a bottle of their Feminine Wash spray, as well as a Monthly Spa Tablet which can be used to have a soothing bath during your period. Intimina's whole vibe is all about women, women's comfort, and women's pleasure. I would advocate for any woman, or their partners supporting them. I am pleased to announce that I have tried the ThermaRelief Patch, Feminine Wash and Monthly Spa Tablet. These are fantastic products and I will be purchasing these as often and I can. First, lets be honest... when you're on your period you can just feel icky. I was having that day yesterday. I felt icky, dirty, and [TMI] stinky. I took a shower and washed myself with the Feminine Wash and took a bath with the Monthly Spa Tablet right after to relax. I highly recommend these products to everyone. They are gentle yet soothing and I felt SO MUCH better after giving myself a little clean up and relaxation. Today I had the joy of experiencing my most painful cramping day which gave me the perfect opportunity to try out the ThermaRelief Patch. I wore some [generous] cotton stretch yoga pants with the fold down fabric and stuck the patches over the thin fabric of the pants. I promptly went to the couch to lay down for a bit with some tea when the cramps were at their most painful. I was able to feel the heat for several hours through my pants. **The packaging says not to stick the patch on skin** I urge you all to try out these products. This company really has women's comfort in the forefront of their minds and I could tell with every single product. I am really happy with Intimina and the Lily Cup!! If you have any questions regarding the Lily Cup, feel free to email me or leave a comment on my blog. Are you going to try their new compact version? How do you clean the lily cup? Is it necessary to boil it every month?